Louise Ackermann was the married name of the poetess born Victorine Choquet. Like Gautier, although less celebrated, she was a figure bridging Romanticism and the Parnassian style. In Hébé she seems much closer to the Leconte de Lisle of the Études latines than to Victor Hugo. (Certainly Reynaldo Hahn’s settings of the Études latines owe a great deal to the modal pudeur of Chausson’s Hébé.) Chausson was interested in Buddhism and other eastern religions and would have been pleased to find tales of Savitri and Sakuntala in the same volume as Hébé—Ackermann’s Contes et poésies (1863). There is a classical grandeur to much of this poet’s work, a style which aims at something divinely impersonal; the composer finds exactly the right tone for this imagery which is remote—in the sense of untouchably Olympian and hieratic—and simultaneously sensual. The music combines intimacy with timelessness, and in a fine performance of the song we hear great art clothed as if in a delicately woven chiton. The use of the Phrygian mode and the shy movement of the dépouillé accompaniment underline the idea of Attic grace and simplicity. Slow crotchets which shadow the vocal line announce Hébé’s entrance to serve nectar and ambrosia as the vocal line expands and becomes more rhapsodic the accompaniment flowers into seraphic quavers which suggest the playing of heavenly harps, a Chaussonian conflation of pagan and Christian heavens. In 39 bars of music (the time signature is a spacious 6/4) there is not a single black note, an embargo on accidentals, which seems to bleach the music as white as marble. And beneath the purely Classical imagery we discern a theme which continually haunted this composer: the passing of youth and the quickly vanishing chance to make use of life’s opportunities. 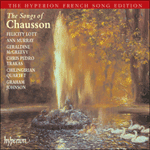 As always in Chausson songs in this tempo (‘Pas vite’) there is a mood of tender resignation, of having lost out. We know that at this time of his life the composer’s thoughts were turning ever more desperately towards marriage. Was the composer infatuated with the dedicatee of this song, one Mlle. Eva Callimaki-Catargi, a woman undoubtedly of Greek origin whom Fantin-Latour painted on two occasions, the first time in his La leçon de dessin where she is depicted copying a Greek plaster? If Chausson thought of setting a Greek poem to do her homage (the song was composed well before the composer’s marriage) we should be grateful to Madamoiselle Callimaki-Catargi for having inspired one of the masterpieces of the mélodie repertoire. Et de nectar I’enfant la remplissait. Nous l’ignorons, il enivre et ravit. Hébé s’éloigne; on la rappelle en vain. Which the child replenished with nectar. Vie in proffering her our goblets. What is the wine she dispenses? We do not know; it elates and enraptures. Hebe goes on her way—you summon her in vain. We follow the cup-bearer with weeping eyes.